It may be a slightly arbitrary milestone, but the Mac app-in-progress XMDS has performed the first instance of a deed that might be argued as being useful. Most of the sketching functionality is now operational, which combines pretty much all of the drawing capabilities of the MMDS app and the SketchEl desktop structure drawing tool, as well as a few new ideas. The feature that was added today is clipboard interoperability, which means that structures can be used elsewhere. 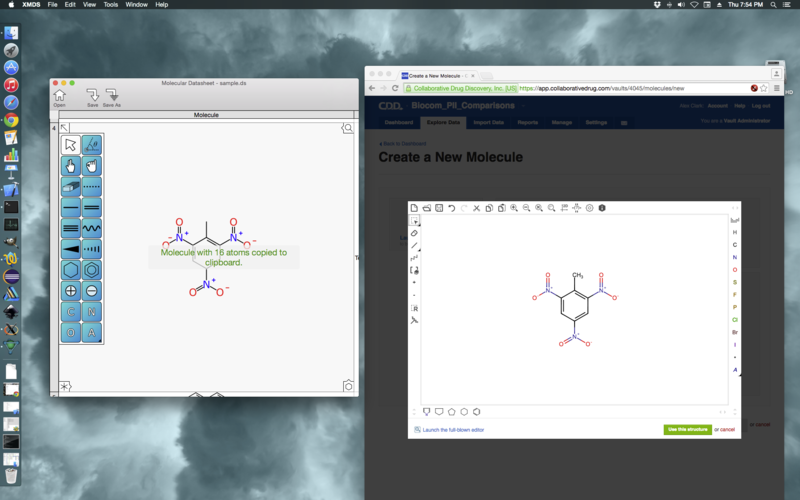 In this screenshot, the structure has been pasted into an instance of CDD Vault in the browser, in draw-new-molecule mode.